This article is about the Travelodge brand around the world. For the Travelodge brand in Europe, see Travelodge UK. The Travelodge brand was one of the first motel chains in the United States. Scott King, the Travelodge Corporation founder, incorporated in Southern California in 1939. The first TraveLodge opened in San Diego in 1940. For many years, Travelodge was headquartered in El Cajon, California, east of San Diego. During its early years, TraveLodge emphasized itself as a budget motel chain that offered functional accommodations at rates lower than other chains. TraveLodge also emphasized that its motels were centrally located in or near downtown areas in order to be convenient to local restaurants, churches, theatres, shopping areas and tourist attractions. Today, however, there are many different hotel "tiers" that Travelodge offers, from budget-priced properties to full-service high-rise hotels. Travelodge purchased the Skylight Inn of America Inn in 1987, which was founded only five years prior in Cleveland, Ohio, and Lodge Keeper Group, which operated LK and Country Hearth, in 1990. In 1996, the Forte Group sold the Travelodge operation in North America. The trademark rights and franchise system were acquired for $39 million by HFS Inc., owner of other hotel brands such as Days Inn and Ramada. HFS was later merged into Cendant Corporation, and Cendant's hotel services, including Travelodge, were spun off as Wyndham Worldwide in 2006. Targeting families with children, Travelodge is best known for its mascot Sleepy Bear, a half awake teddy bear wearing a sleeping cap with his name, a robe with the Travelodge logo, and slippers. The logo was created in 1954 by Robert Hale, while employed by Dan Lawrence Advertising agency of San Diego. Years ago, Travelodge would give a free toy plush bear to any child staying in the Sleepy Bear Den room, of which every Travelodge had at least one. Travelodge also has a brand of lower-price motels called Thriftlodge with another mascot named TJ, a freckle-faced bear with a baseball cap and a T-shirt with the Thriftlodge logo and the name TJ on it. The Canadian Travelodge hotels are unusual for a Wyndham chain. Though operating under the Travelodge brand, Travelodge Canada administers the Master License for Travelodge and Thriftlodge in Canada. Travelodge Canada Corp. is owned by Superior Lodging Development TL Corporation based in Calgary, Alberta. With over 95 properties nationwide, Travelodge is the third largest hotel chain in Canada. Travelodge has been running in the UK since the first hotel opened at Burton Upon Trent in 1985. The company has been through several changes of ownership, and reached £1bn in debts by 2008. The chain is currently being financed by Goldman Sachs and the hedge fund groups GoldenTree Asset Management and Avenue Capital Group. Headquartered in Australia and Singapore, Travelodge Hotels Asia is responsible for the development, management and franchise of all Travelodge hotels in 22 key markets throughout Asia. The launch of Travelodge Kowloon in Hong Kong in January 2017 marks a first strategic step and key milestone for Travelodge Hotels Asia. The company, owned by Singapore-listed ICP, has plans for expansion in other Asian countries including Thailand, Singapore, Malaysia, Indonesia and Japan within the next few years. ^ "Three Cleveland area firms have begun a joint venture". United Press International. September 2, 1982. Retrieved 20 July 2018. ^ "Skylight Inns is New Hotel Chain". Youngstown Vindicator. 2 September 1982. p. 70. ^ Jakle, John A.; Sculle, Keith A.; Rogers, Jefferson S. (1996). The Motel in America. Johns Hopkins University Press. pp. 156–160. ISBN 978-0801869181. ^ "About Travelodge". Travelodge. Retrieved 20 July 2018. ^ Cave, Andrew (15 February 2015). "Travelodge has 'complete makeover' as it focuses on families and business". The Daily Telegraph. London. Retrieved 30 March 2015. ^ Min, Chia Yan (23 June 2014). "ICP acquires Asia Pacific rights to Travelodge brand". The Straits Times. Singapore. Retrieved 20 July 2018. 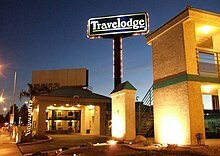 Wikimedia Commons has media related to Travelodge.